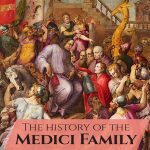 Today we have launched our 10th online history course and it's another wonderful course from best-selling author and historian Toni Mount. 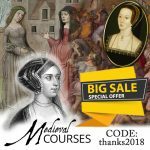 We're celebrating with a $10 discount coupon off all our courses - see the bottom of this post for details. 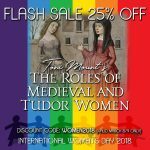 This new 12-unit course is called "The Roles of Medieval and Tudor Women". 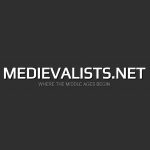 It explores the life of medieval and Tudor women, from the rural housewife to the women trading in the city of London, whether as a reputable silkwoman or as a prostitute. Historian Toni Mount has used a wide range of contemporary sources - such as medieval literature, wills, personal letters, household accounts and legal documents - to uncover what life was really like for ordinary women living in a time when their gender and class virtually determined their lives. Real life examples are given and topics covered include housewifery, childbirth and childcare, food and drink, women with trades, religious attitudes towards women, the impact of the Black Death and Manor Courts, the Sumptuary Laws and fashion, and just how much work a housewife had to fit into her day - "A woman's work is never done!" would ring very true for a medieval housewife! This course brings into focus how our doughty ancestors lived, loved, laboured and, eventually, met their Maker. 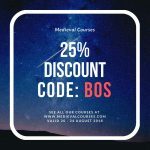 Course participants will have lifetime access to the audio lessons, transcripts, end of lesson quizzes, bibliography and resources. Each participant will also receive an end of course completion certificate. Click here for more details on this course. To celebrate the launch of our 10th course, we are offering a $10 discount off each and every one of our courses from today until the end of 31st October 2017. The coupon code is AUTUMN2017 and you can use it as many times as you like. Our courses give you lifetime access so why not buy a few and then do them when you want? Click here to view all our courses. 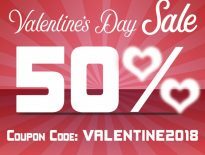 Next Post: A Valentine Gift – 50% off all of our online history courses!